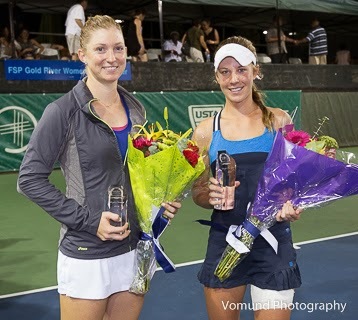 of Newport Beach 6-2, 7-5 to win the $50,000 FSP Gold River Women's Challenger. GOLD RIVER, Calif. -- There's nothing unusual about night matches in professional tennis. Night finals are another matter. The $50,000 FSP Gold River Women's Challenger, which began in 2012, had one Saturday for the second straight year to avoid Sacramento's sweltering summer heat. Furthermore, the doubles final was played first. And rather than conduct a brief awards ceremony between matches and save the formalities for later, the emcee thanked everyone except John Sutter for discovering gold in nearby Coloma in 1848. By the time the singles final started, it was 8:33 p.m. And it easily could have been later, as the doubles final lasted only 51 minutes. Top-seeded Olivia Rogowska handled the day-long wait much better than seventh-seeded Julia Boserup to triumph 6-2, 7-5 at the Gold River Racquet Club. Rogowska has exceptional mental toughness and far more big-match experience than Boserup. Incredibly, the 5-foot-11 (1.80-meter), 145-pound (66-kilogram) Boserup missed her opening 10 first serves and 13 of her first 14. In the opening game, she double-faulted three consecutive times and was broken. Of her first seven serving points spanning two games, four were double faults. Boserup, 22, of Newport Beach converted only 30.4 percent of her first serves in the opening set and was broken three of four times. "I was in a hurry to get on the court, excited to play tonight," said Boserup, who played in her first final since winning the $25,000 Rancho Santa Fe Challenger in the San Diego area in February 2012. "I just didn't get off to the best start, the start I was hoping for." Then, in a major understatement, Boserup added: "My rhythm was a little bit off on my serve. It started to get better in the second set but never came back fully. I was tying to take it one (serve) at a time, and that's how it is with tennis. Every day is different." with Daria Gavrilova of Russia. Especially when the match is at night. Boserup actually converted a whopping 82.4 percent of her first serves in the second set, which she led 5-2 (one break). She had two set points serving at 5-3, but the fearless Rogowska erased them with backhand and forehand winners. Boserup double-faulted twice in the game, and Rogowska broke by inducing an error with a sharply angled cross-court forehand. Rogowska held serve, then broke again to lead 6-5. From 30-15 in the game, Boserup sailed three consecutive groundstrokes long. Rogowska held again for the match with the help of two aces, including one on her second match point. Rogowska, rail thin at 5-foot-9 (1.75 meters) and 128 pounds (58 kilograms), finished with nine aces to Boserup's two and no double faults to Boserup's 10 in the players' first career meeting. "I just mentally really hung in there, even when I got down in the second set," said Rogowska, a 23-year-old Australian who's three months older than Boserup. "I fought extremely hard for every single point, and that pays off in the end. Once I got it back to even, the momentum went my way." While the quick Rogowska relentlessly chased down balls, Boserup didn't try for some shots in the corners that she might have reached. Rogowska has played in the main draw of singles in 10 Grand Slam tournaments (reaching the second round three times) and won 25 ITF (minor-league) singles and doubles titles combined. The corresponding figures for Boserup are none and two. Rogowska pocketed $7,600 for her 10th ITF singles title and second this year. She will rise from No. 127 in the world to No. 110, two spots below her career high and third in Australia behind No. 19 Samantha Stosur, the 2011 U.S. Open champion, and No. 36 Casey Dellacqua. Boserup, who was seeking her third ITF singles crown and third in California, earned $4,053. She will improve from No. 222 to No. 200 on Monday. Boserup peaked at No. 174 in 2012 but missed the first half of last year with a bulging disc and tumbled to No. 510. She returned to action in last year's Gold River Challenger and lost to former top-20 player Alisa Kleybanova of Russia in the final round of qualifying. "This one stings right now," Boserup said, "but tomorrow when I look back at where I was last year, not even playing tennis, to (reaching the final), it's a good improvement to keep building on." Rogowska, meanwhile, showed her mental fortitude throughout the week. She won a first-set tiebreaker in a straight-set victory in the second round and prevailed in the quarterfinals and semifinals after losing the first set. In fact, Rogowska came within a tiebreaker of losing in straight sets to sixth-seeded Sachia Vickery of Hollywood, Fla., in the quarters. "The level of tennis, especially in the girls, is so similar (in the Challengers)," said Rogowska, whose parents moved from Poland to Australia two years before she was born. "We all hit a pretty clean ball. It's all mental, to be honest. The girls in the top 100, the top 50, are so mentally tough, so I feel like I'm getting better at being more consistent with that attitude, and hopefully I'll continue this good form." 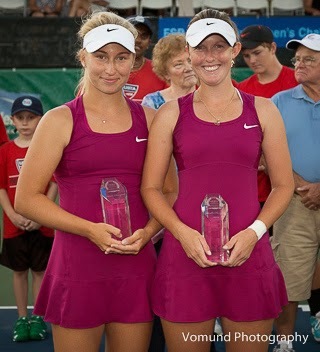 Another Aussie, Storm Sanders, won the doubles title for the second consecutive year. Sanders, a 19-year-old left-hander, and Daria Gavrilova, a 20-year-old Russian living in Australia, routed California products Maria Sanchez and Zoe Scandalis 6-2, 6-1. Both teams were unseeded. Sanders, who's named after a character in a series of popular historical novels by South African Wilbur Smith, triumphed last year with 6-foot-2 (1.88-meter) Naomi Broady of Great Britain. Broady did not return this year after reaching the Wimbledon mixed doubles quarterfinals with countryman Neal Skupski last week. Gavrilova played in her first tournament since undergoing reconstructive surgery on her right ACL last November. She won two Grand Slam girls titles, U.S. Open singles in 2010 and French Open doubles in 2012. Sanchez, 24, was born and raised in Modesto and graduated from USC in 2011. She won the singles championship and reached the doubles final in the inaugural Gold River Challenger and captured her first title on the elite WTA tour in January, teaming with Sharon Fichman of Canada for the Auckland doubles crown in January. Scandalis, from San Diego, will be a senior at USC in the fall. Olivia Rogowska (1), Australia, def. Julia Boserup (7), United States, 6-2, 7-5. Daria Gavrilova, Russia, and Storm Sanders, Australia, def. Maria Sanchez and Zoe Scandalis, United States, 6-2, 6-1.